The MTR-101 Reeling Machine is specifically designed for Aerial Target Missions and provides aerial deployment and recovery of tow targets and is the premium system available today. 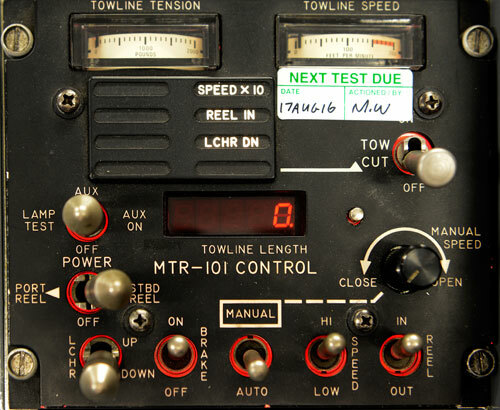 The MTR-101 system is includes a Operator's Control Panel, interconnecting electrical loom and a lightweight flight proven, compact, two-way Reeling Machine which provides launch and recovery of a wide range of towed target configurations. Horsepower is provided from free-stream dynamic pressure using a ram air turbine and requires minimal electrical power from the host aircraft. The reeling machine is a removable external aircraft store providing rapid changeover capability for multi-use aircraft and has extremely low drag. The tow reel is designed to accommodate a variety of targets, for both air-to-air and surface-to-air weapons training systems. Either constant diameter for stepped diameter cable may be utilised to display targets on towlines up to 30,000 feet (9,144) metres) in length. The Operator Control Panel, provides the user with readouts for towline reeling speed and tension, as well as an array of status indicator lights and function control switches. Either semi-automatic or full manual control of the tow cable reeling process may be selected in flight by the operator. Additionally, for those installations which require two (2) tow reels and targets (mounted under each wing), an option is available to control each tow reel sequentially using a single operator control panel. The MTR-101's unique rotary arm target launcher mechanism provides a target carry position (rotated up and to the side) which maximises clearance distance between the target/reel combination and runway during aircraft take off, rotation and landing flair attitudes. During target launch, the launcher arm and target are rotated 90 degrees down from the side carry position to directly beneath the reeling machine. The launcher arm can also be configured to swing inboard or outboard. The launcher arm remains in the down position during the target-out-tow portion of the training exercise. The extended launcher arm provides an extremely stable airborne launch and recovery platform for targets in a region, free from aircraft generated air turbulence. Additionally, the extended launcher arm also ensures critical separation distance between tow cable and tow aircraft fuselage/tailpipe areas during high "g" manoeuvres required by some air-to-air gunnery training scenarios. Once the weapon tracking or firing exercise has been completed, the target is reeled into the launcher arm and both arm and target are rotated upward to the target carry position. The removable spool is a feature that is used to minimise turnaround time if a target/cable has been damaged or shot off. This feature allows the user to replace the flight spool of cable and attach a new target while the aircraft is refueled. A camera is installed that monitors launch and final recovery of the target and is a standard feature. This provides the operator with valuable data concerning the stability of the target due to possible target damage during firing the exercise. Extensive flight testing of the MTR-101 has been performed with a variety of aircraft and targets, resulting in flight certification by the Civil Aviation Authority in England, the Department of Aviation in Australia, the LBA in Germany,The Federal Aviation Administration in the United States and in the FMV in Sweden. MTR-101 systems are currently operational with users in 10 countries.